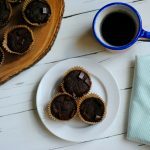 You'll never guess what the secret ingredient is in these tasty chocolate muffins! Preheat oven to 375 degrees. Line a muffin tin. Place all ingredients in a blender and blend until smooth. Fill each of the muffin cups close to the tops, until all of the batter is used up. Bake for 17-18 minutes, until a toothpick inserted in the middle comes out clean. My favorite chocolate chips are Enjoy Life because of the minimal ingredients included.